Left over poha and you do not want to eat the same again. What to do? Cannot throw it even and here I do not have anything like, where I can give it to the needy one. Thinking cap on…. I decided to throw in some onion, some coriander, some masala’s and make a tikki and let’s see how it goes. (Infact its being a long I made it and I do not remember the meausrements). I am just putting the recipe based on 1 cup left over poha, Quantities can increase or decrease and accordingly adjust the masala’s. If you want to eat it without onion, I guess add bread (soaked and squeezed) in water as a binding agent to it and lightly give a coating of suji (rawa) to it to become a little crispier. I have not tried it yet, but I think it will be yummy. But they were yummy. My husband could not even think what it is made of. ½ inch of ginger grated. 1-2 tablespoon of coriander grated. Mix all the ingredients together and press the poha in your hand like making ladoos. We need to form a lump like so that we can make the tikki’s, it will eventually be done as onion will release water, when mixed with salt. Make small balls and press it lightly to make a tikka shape. Heat a pan and drizzle around 1 tablespoon of oil. Place the tikki’s on it and cook on both sides until golden brown. 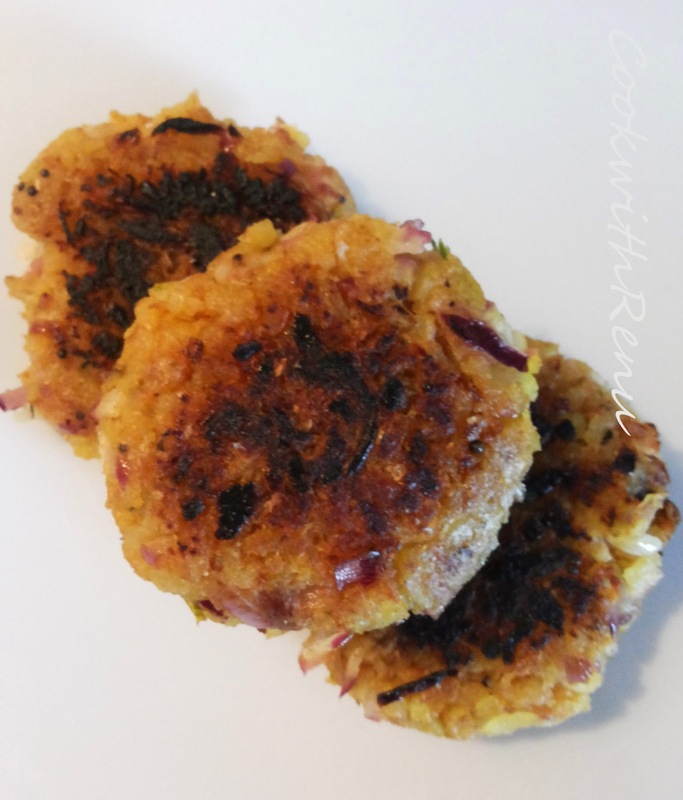 Yummy tikki’s are ready, serve it hot with tomato ketchup or can be used as a side dish.